Designers Kaza Razat and Imani Powell definitely have a playful, urban aesthetic with their work. But this is a little bit weird. 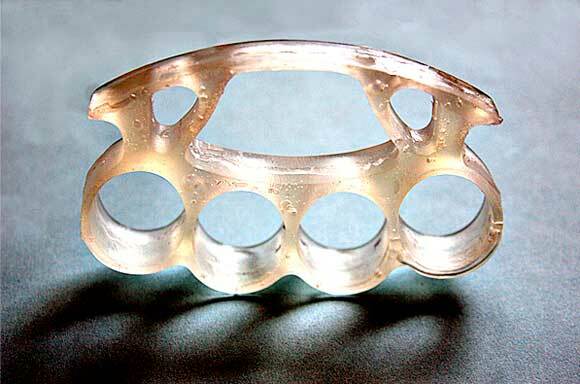 I never understood the need for decorative soap—shaped as Brass Knuckles or not. WTF? Who is the customer here? It’s gotta be either heteroflexible guys, big bears, or their butchy female counterparts, because I seriously doubt that there are a lot of straight girls out there looking for soap in the shape of brass knuckles. And girls, if you’re thinking about buying your man some decorative soap, don’t do it…If for no other reason than the $15 price tag. Yikes.